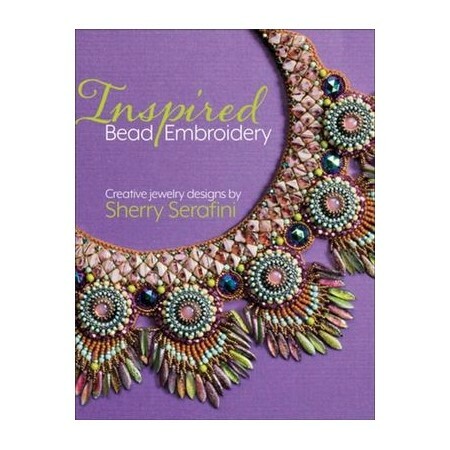 For years, fans have been asking for a new title from Internationally known artist and instructor Sherry Serafini, renowned for her lavish beaded surfaces - and this book is it! Sherry's adventurous designs have appeared in numerous books and well-known magazines. Rock stars Steven Tyler, Lenny Kravitz, and Melissa Etheridge have worn her beaded works of art. In Inspired Bead Embroidery, Sherry offers 15+ exciting new projects that combine her textured designs with eye-catching focal beads. The gorgeous, 128-page hardcover book explains the fundamentals and aesthetics behind Sherry's work, from stitches and materials to color theory. Sherry's textured, dimensional projects include earrings, cuffs, collars, and two fashionable purses. The creations incorporate seed beads, cubes, triangles, drops, daggers, cabochons, leather, fiber, and more. Each projects includes concise instructions, well-chosen process shots, and diagrams. A gallery at the end of the book provides even more inspiration for experienced beaders looking to take their work in new, more exploratory directions.